Directly above this, the master bedroom is designed around a large, south-facing picture window, which looks down onto the veranda and out across the lagoon. Reflections from the water below play across the ceiling, and the rest of the space is simply furnished to ensure the view is the focus. Go low and wideIf your window isn’t recessed or the glazed area is quite slim, it’s still possible to build an ample window seat. Here, the designers have constructed a low-rise surface, which doubles up as a handy seating and storage area for a reading lamp and books. Go lowEven a low window can have a bench seat beneath it, as this space illustrates. 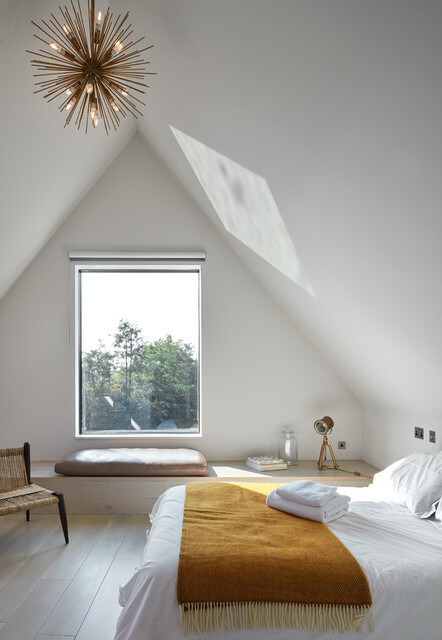 A wall-to-wall platform has been constructed along the gable end wall of the loft room, which allows someone to sit beside the window and gaze at the view.The beauty of this particular design is that it provides two functions – the cushion forms the seat, but the rest of the platform doubles up as a display space.